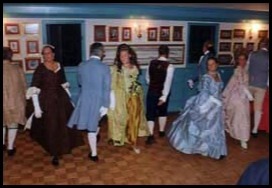 Newport House Bed and Breakfast hosts Colonial Dancing (known as English Country Dancing) on Tuesdays year round from 8 to 10 pm. (generally not in Colonial clothes). Guests may watch or participate if they like (beginners welcome). Newport House guests normally discover the biggest obstacle to Colonial Dancing is working up the strength to give it a try. Once over that, they quickly find its quite easy, with several steps repeated in different combinations. As an aside, once you have enjoyed an evening or two dancing in our Ballroom, you will delight in the next dance scene you see in a Jane Austen movie. Even modern Square Dancing has its roots in the more elegant English Country Dancing and you will instantly recognize steps you know. Newport House offers an exclusive arrangement for our guests to rent at a reasonable charge fine Colonial clothing, either for their entire stay or simply to go out to dinner at one of the Colonial taverns (adult sizes only; Colonial Williamsburg rents out Colonial clothing in children's sizes). "A wonderful experience! It made our trip to Williamsburg extremely pleasant – outstanding!"